A great way to personalize your home theater library or organize your store. 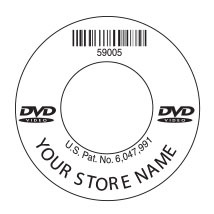 Imprinted in black ink with store name and 6 digit DVD bar code. Prepayment and written confirmation required Available on rolls of 500 and pricing is per roll.